At a press conference in New York moments ago, Google officially announced Google Wallet, an open near-field communications platform, and Google Offers, a deal’s program that will work with the Google Wallet. Partnering with Mastercard, First Data, Sprint, Citi Bank, Google plans to let you take everything in your wallet and move it to your phone with an easy-to-use application. The goal is for all credit cards, store loyalty programs, and coupons to eventually be compatible with the Google Wallet system, which lets you tap your phone at a pay spot to complete a transaction, much like MasterCard’s PayPass technology, which has been in use for some years now. The technology platform will be open for RIM, Apple, and other competitors to use, as long as they integrate NFC chips into their phones. Field testing will begin testing in New York and San Francisco (and Portland for Google Offers), and it should launch everywhere this summer. The only Android phone currently equipped with the NFC chip necessary to use this technology is the Samsung Nexus S, but most upcoming Android phones will supposedly integrate the chip. According to Google, more than 120,000 U.S. merchant locations are already equipped to begin using this technology. Retailers like Subway, Macy’s Walgreens, Toys R Us, and Noah’s Bagels have already signed onboard. The Wallet supports multiple credit cards, multiple store loyalty cards, and uses passwords, encryption, physical proximity, and a lot of other “special sauce” to ensure that the process is actually safer and more secure than any other digital payment system. 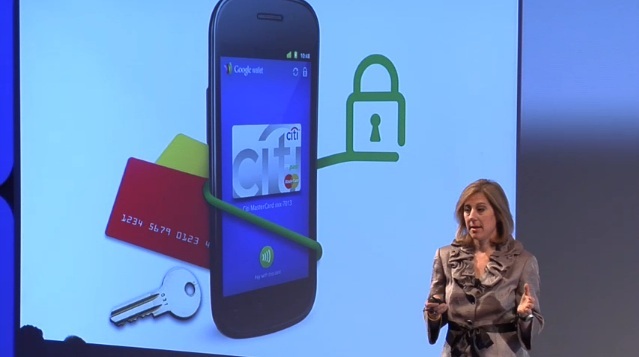 Google claims that it is actually more secure than having a real wallet. Of course, a real wallet doesn’t run low on batteries. Google Offers will be similar to Groupon-style deal sites and will integrate into the Wallet ecosystem. We’ll have a separate post explaining how the whole system works shortly.